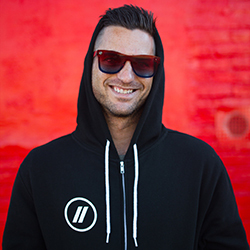 Blenders Eyewear was founded in 2012 by Chase Fisher. The idea spawned when Chase went to see one of his favorite DJs at a Downtown San Diego nightclub. His neon green “beater” sunglasses received an overwhelmingly positive response, and what started out as a night full of close friends and good music quickly escalated into a full-fledged obsession with sunglasses. After further research Chase learned that one company lords over approximately 80% of the global sunglasses market, he knew it was a broken system begging for disruption. And disrupt he did. Chase believes in the hustle, he started a grassroots effort buoyed by social media and his SDSU network, selling shades out of his backpack while doubling as a surf coach during the company’s first year. He leveraged his background as a sponsored athlete (surfing, snowboarding) to develop sunnies with scintillating style and adventurous spirit—the visual embodiment of the company’s "live in forward motion" maxim. It’s been this steadfast self-determination—and the combined efforts of the San Diego-based company’s 24-person team—that’s established Blenders as one of America’s fastest-growing sunglasses brands today.